Smartphones allow you to capture photos and videos, and the same goes for voice records. The sound of your voice, the sounds of other people’s voices or background noises, all of that you can record only with using your phone, without carrying other special voice recorders. There are a lot of voice recorder apps for android phones, so we want to help you to choose the one that is perfect for your needs. What is RYL – Record Your Daily Life Project? If you always forget something to do and you need reminder about the stuff you need the finish, no need for writing things down. Use this android voice recorder to record yourself about important responsibilities you need to complete or other people’s voices for a reminder. 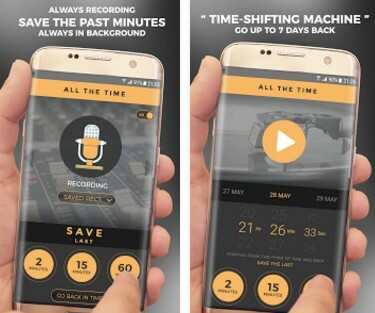 With this app the users are able to record sounds and keep them permanently or delete them after they don’t need them anymore. Users are offered to keep the recorded sounds a week back giving them time to listen every recorded file and keep what they need. This android app for recording sounds launches automatically without the need to configure it. You are guaranteed complete privacy because the app doesn’t let the other apps to post the saved audio filer or to use the mic. Gives great sound quality and all of that in a small size. No internet connection is need for the users to record sounds, making it available always. You can listen the recorded audio files from the week back and decide to keep them or not. Even if you are always recording, this app only uses minimum battery. Sounds great? Another great thing about RYL is that it works as a microphone shield. It provides with a feature that blocks other apps from using your microphone (such as Facebook, Google, Amazon Alexa, etc.). So you will be able to enjoy full privacy and safety! You need to make your days more productive? You hate writing things down? This is a great and simple way for you to get through the tasks easy. Download it now on Google play for free!